Eating kiwi for breakfast is a sweet, refreshing and healthy way to start the day. Just one-half of a cup of sliced kiwi offers essential nutrients and as much vitamin C as a medium orange. 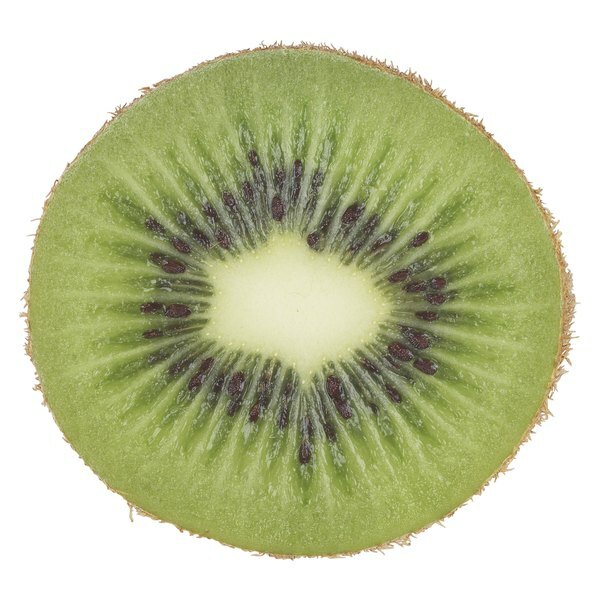 When you're in a hurry, eating a kiwi on the run is better than skipping breakfast, but for a nutritionally complete meal make sure you include whole grains and a source of calcium, such as milk or yogurt. Kiwi is a simple fruit to eat and although many people peel it, that isn’t a necessary step. The skin is thin, edible and similar in texture to a peach. Pick fruit that is firm but with a little give and without wrinkles. Unripe kiwis ripen in three to five days if you leave them out and they can be stored in the refrigerator up to two weeks if you put them in a plastic bag. Sliced or chopped kiwi can also be frozen. Kiwi makes a good base for a breakfast smoothie blended with yogurt and apple juice. Use chunks of frozen kiwi for a thick, cold smoothie and add other fruits or vegetables for extra nutrition. Make kiwi the star of a fresh-fruit salad mixed with chopped fresh mint for an aromatic and vitamin-loaded breakfast or layer with lemon yogurt and granola for a quick parfait. Mix diced kiwi with vanilla yogurt as a topping for pancakes or waffles, but eat it quickly because kiwi will curdle dairy products if left too long. Pancakes take on added sweetness and texture when made with minced kiwi. For something a little lighter, use kiwi to fill rolled-up crepes. Bake muffins with diced kiwi and use whole wheat flour or oat bran for a fiber-laden breakfast. For a fancy breakfast dish, make a kiwi tart. Bake a tart shell using pre-packaged pastry dough to save time, or make your own to control the ingredients. Spoon thickened yogurt into the cooled shell and top with slices of kiwi. Kiwi contains only 50 calories in each half-cup serving, with 3 grams of heart-healthy fiber, 1 gram of protein and no fat, cholesterol or sodium. Each serving provides 140 percent of the vitamin C you need every day, as well as measurable amounts of vitamin A, calcium and iron. Kiwi is also a good source of lutein, which aids in eye health and may help protect against heart disease and some cancers. The Utah State University Cooperative Extension notes that two kiwis are a better source of potassium than one banana.